Photo: JTB/Getty Persian cuisine comes in two categories: you'll find the first, kebabs accompanied by basmati rice and a grilled tomato, just about anywhere, but it's the slower dishes, like decorated mounds of rice, minced meatballs and squishy eggplant and beef stews, that deserve celebration. On the street, keep an eye out for stands selling salted green almonds or scoops of thick rosewater ice cream. Iranians also have a soft spot for American junk food, and if you're looking for a taste of home, you won't have to look too far to find a spot that serves hamburgers or "Kentucky" (fried chicken). Photo: Sarra Sedghi The dollar is strong in 2016, and that's especially true in Iran. One U.S. dollar currently equals 30,186 rial, so you'll be able to get the basics for cheap. Of course, if you're looking to spend some money, stroll through a grand bazaar and search for deals on gold jewelry, ceramics and high-quality rugs. Photo: JTB Photo/Getty Art exists everywhere in Iran, from sacred shrines with crystalline ceilings to the intricately woven rugs that are woven into everyday life. 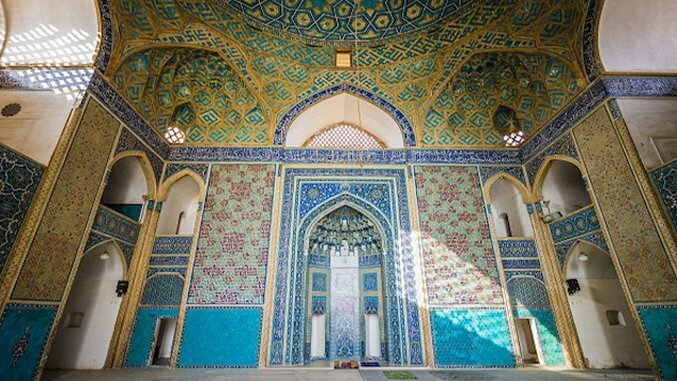 Mosques dazzle with their swooping architectural arches and public surfaces are paved with azure mosaics, while patronage for literature spans an entire city. Tehran's Carpet Museum of Iran celebrates intricate rugs dating back to 500 B.C., while the literary city of Shiraz honors poets such as Hafiz (Rumi) and Saadi and brims with lavish gardens. Photo: JTB Photo/Getty Along with a vast history, Iran boasts impressive architecture reflecting its days as an empire. Some of the best examples of Achaemenid architecture exist in the ruins of Persepolis (pictured), the Naqsh-e Rustam necropolis and Zoroastrian temples. In Isfahan, you'll find classical Islamic architecture spanning a spectrum of 800 years, including the Nagsh-e Jahan Square, a UNESCO World Heritage Site. Photo: JTB Photo/Getty Before Iran became an Islamic republic in 1979, it operated under the Persian Empire, which once stretched to present-day Macedonia and Pakistan. Before Islam spread throughout the Middle East, Iran was a center of Zorostrianism, one of the oldest religions in the world. Many of the religion's relics, including the Yezd Atash Behram, a Zoroastrian fire temple, and holy Towers of Silence, still exist in the central Iranian Yazd province. Photo: Atta Kenare/Getty Hospitality is intrinsic to Iranian culture and usually comes in the form of free food or kindness towards a guest—in this case, that's you. Don't waste the opportunity to enjoy a local's warm gesture, whether it's in the form of a home cooked meal, a friendly game of backgammon or a strong, steaming cup of tea. Photo: Klaus Rose/Getty Iran is the 18th largest country in the world, and all that space includes a varied geography. The country's topography is dotted with mountain ranges, deserts, forests and saltwater lakes like the Caspian Sea, the largest lake in the world. In case you weren’t aware, the United States and Iran are on good terms now, and the travel sanctions that stood in the way—until very recently—have been lifted. Iran has been a popular destination among European tourists for years. The Iranian rial has a low exchange rate with currencies like the Euro and U.S. dollar, slashing daily expenses. You’ll spend less than $10 on a decent meal. But, Persia has far more to offer than a great deal and new political friendships. Home to one of the oldest civilizations and empires in the world, Iran boasts a rich artistic, architectural and culinary culture and brims with hospitality. And, by the way, the country is geographically beautiful. As an Islamic Republic, Iran enforces rules unfamiliar to Americans, namely prohibition and dressing in the hijab style. As far as the dress code goes, covered extremities and a headscarf will do the trick in most places, and more conservative establishments like historic mosques offer free shawls to anyone who’d like to cover up a bit more. Travelers donning extra layers may want to avoid visiting during the summer, especially if they’re coming to the country’s warmer, southern half where temperatures can climb into triple digits. In early spring, many Iranians go on vacation to celebrate Norooz, the Persian new year, so in addition to temperate weather you’ll encounter less city traffic and lightheartedness among the locals. Sarra Sedghi is a freelancer based in Athens, Ga. She has been to Iran and enjoyed it very much.